If you’re looking for value for money, yet classy looking laptop for business and professional use, the HP 250 G2 could well be your option. This new model introduces the Windows 8.1 to the series and like its predecessor, the HP 250 G1, it comes at a very competitive price, depending on the processor variant you pick and offers a professional look, portability, and flexibility for work. HP 250 G2 features a 15.6 inch with a charcoal black case, in mostly matte finish with sturdy chassis to bear the everyday wear out. The classy velvet finish is sensitive to fingertips though. The battery too gives you a decent 4.5 hours which is pretty much the norm for most laptops in this league. HP 250 G2 is available in touchscreen and non-touch models, both offering 1366 x 768 pixels resolution. The connectivity is the usual one USB 3.0, two USB 2.0, head/ micro phone combo- jack that can be expected in this price range, though the positioning may hinder the use of an external mouse. The keypad that features a numeric block is standard with a reliable touchpad. HP 250 G2 offers you a bit of options for your processor. So you can choose between Intel Core i3, Pentium, and Celeron dual-core processors. The memory is 4GB 1600MHz DDR3L SDRAM with 2 memory slots. The Intel HD Graphics can handle a bit of multimedia, but an Adobe Photoshop will make your notebook sluggish. The 3DMark (2013) Graphics Card reiterates that this notebook is meant for office use. HP 250 G2 Laptops feature 320GB, 500GB, 750 GB, or 1 TB Hitachi hard drives. A notable feature of HP 250 G2 is its passive cooling system which makes for quiet operation. HP 250 G2 offers a DVD burner, modest speakers, HD webcam and a 12 month warranty. And you can opt for a pre-installed Windows 7 Professional 64, Windows 8.1 Pro 64, Windows 8.1 64, Ubuntu Linux or FreeDOS 2.0 (all options may not be available). 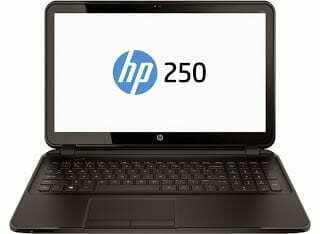 HP 250 G2 affordable laptops are available in Nigeria. HP 250 G2 price in Nigeria starts at around N62,500, depending on your location and the configuration of the laptop.